The dark side of globalization: why domestic firms ask for government protection in the form of tariffs. - FreeEconHelp.com, Learning Economics... Solved! Home microeconomics tax trade The dark side of globalization: why domestic firms ask for government protection in the form of tariffs. The dark side of globalization: why domestic firms ask for government protection in the form of tariffs. While most economists agree that globalization is good in the aggregate (meaning on the whole, or considering everyone), there are always going to individuals that lose from free trade and globalization (also called liberalization). In this post we will go through an example of why domestic firms producing t shirts are angry with the fact that they must compete with foreign firms, so ask for government assistance in the form of tariffs. A real world example of this battle is shown here looking at the economics of US and Canada's softwood timber market. First let’s consider a domestic firm that produces t-shirts. 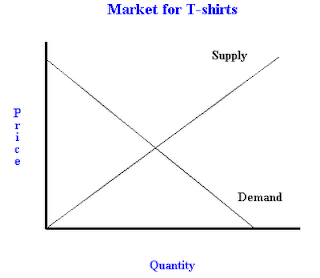 From this graph we can easily see where equilibrium price and quantity are (where supply and demand intersects). This is good for the domestic firm because they are selling an amount they are happy with for a reasonable price. Now if we allow cheaper products to be imported from another country, it will change this graph up a bit, and change around our equilibrium price and quantity. The domestic firms are unhappy with the lower world prices because they now sell less t-shirts (from Q* to Qd) and receive a lower price for the t-shirts they do sell (from P* to Pw). 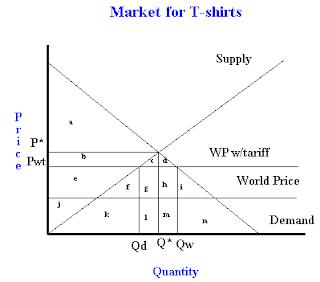 Notice that the market is still in equilibrium, because the quantity supplied (domestic supply equals Qd, foreign supply equals Qw-Qd) is still equal to quantity demanded of Qw. The reason we see a lower world price is because of another supply and demand graph happening for the entire world. 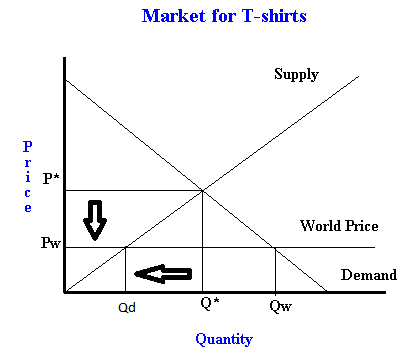 In this market a new equilibrium price is reached at a lower price, which then translates into the “world price” line we see for our domestic market of t-shirts. Now firms do not like having business taken away by foreign competitors. This means less production going on in the home country, and a lower price received for the goods that they do manage to sell. What firms can try to do is get regulation or laws passed that potentially limit the amount of goods that can be imported. We will consider the impacts of tariffs on the previously described market. 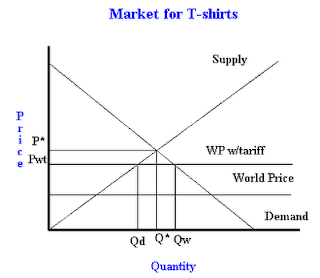 You can see from the graph that a tariff will increase the domestic price for t-shirts above the world price, and it will increase the quantity of t-shirts that are supplied domestically. 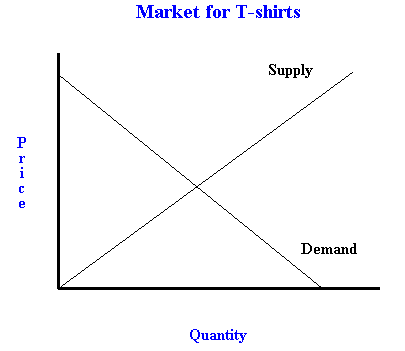 This is good news for domestic firms because they get to produce more shirts, and get a higher price. If the domestic firms also don’t have to pay any lobbying fees, they will really like these tariffs. However, the introduction of tariffs produces a deadweight loss on the economy, which is why most economists oppose tariffs and promote free trade. So after the imposition of the tariff, the over surplus of the economy goes down by the amount of f+i. You can see this in the graph because it used to be part of the consumer surplus, and now it is neither in producer surplus or government revenue.